The scientific name for Cayenne is Capsicum frutescens or C. annum. There are a few other names for Cayenne as well. Cayenne is also called capsicum, hot pepper, red pepper and African bird pepper. More than anything, Cayenne is called Capsicum. The parts of the Capsicum (Cayenne) plant that are used medicinally for this herbal ingredient are the berries. The capsicum fruit family has many herbs in its family. The activity of the herb in that family is measured by BTU ratings (British Thermal Units) in other words, how hot it is. Remember as you read further that the names cayenne and capsicum will be used interchangeably, being both of the same family. The hot, biting taste of the fruit from the cayenne pepper plant was first introduced to Europe with the return of Christopher Columbus from the New World. In fact, its name comes from the Greek word "to bite." Capsicum has been fittingly described as the plant that bites back. Although Cayenne was probably cultivated for hundreds, even thousands, of years in the tropical Americas, Africa, India, and other tropical areas of the world, Columbus seems to have been the first Westerner to take conscious note of food flavored with this pungent herb. The North American Cherokee Indians used Cayenne for its stimulating properties, while the Navajo's used it as a means of weaning children. In 1943, the Dispensary of the United States of America reported that "Capsicum is a powerful local stimulant, producing when swallowed, a sense of heat in the stomach and a general glow over the body without narcotic effect". Capsicum is used as a catalyst in almost every herbal combination and thus aids the absorption and the effectiveness of the combination. It increases the body's ability to digest anything that's in the stomach. Because of this fact, Capsicum is used as a "carrier or catalyst" herb for almost any herb combination. Those suffering from osteoarthritis and rheumatoid arthritis have been discovering relief using an experimental rub-on cream made with capsaicin, an ingredient of capsicum. Capsaicin is the most important and prominent compound in capsicum. Capsicum promotes perspiration, which anyone who has eaten any "hot" food should know from experience. In tropical areas, many people eat fairy large amounts of hot peppers every day. This may help to keep them "cool" since perspiration is the natural cooling mechanism of the body. Cayenne has a wide variety of uses. It aids digestion, improves circulation, and stops bleeding from ulcers. Most importantly, Cayenne acts as a catalyst for other herbs. It helps your system to better absorb nutrition and therefore, theoretically it should be taken with most blends of herbs for that reason. It's good for the heart, kidneys, lungs, pancreas, spleen, and stomach. Cayenne is also useful for arthritis and rheumatism. This herb has also been known to help to ward off colds, sinus infections and sore throats. Interestingly, this plant is not just to be taken orally. It is also good for pain when applied topically. Some use this remarkable substance in conjunction with lobelia for nerves. Capsicum has been used in tincture form along with a liquid nervine tincture with valerian root and an oriental oil which is then applied topically along the spine and on tense muscles. Keep the body warm, allowing the body to absorb these herbs into the effective areas to promote rapid healing. This is called an herbal adjustment. One should be cautious, however, that they do not allow contact with the eyes with this specific herb. Bodily Influences of Cayenne: Antibacterial, antipyretic, antiseptic, antispasmodic, aperitive, aromatic, astringent, blood thinner, haemostatic, hypertensive, hypotensive, rubefacient, stimulant, stomachic, tonic-general, vulnerary. Like many spices, Capsicum influences the flow of digestive secretions from salivary, gastric, and intestinal glands. Capsicum increases Thermogenesis for weight loss, especially when combined with caffeine type herbs or ephedra. Capsicum gives the system a little cardiovascular lift by exciting the heart; thereby, effectively increasing circulation. Cayenne's red color is due in part to its high vitamin A content, which is essential for normal vision, growth, cellular activity, reproduction and healthy immunity. Capsicum is excellent for warding off diseases and equalizing blood circulation, which works to prevent strokes and heart attacks. It is useful to arrest hemorrhaging (external and internal) and it is cleansing and healing when used to purify external wounds. Capsicum helps to heal ulcers in the cell structures of the arteries, veins, and capillaries. Cayenne is known as the best and purest stimulant in the herb kingdom and has been called by many as the purest and most effective stimulant in the very large herbal bag of medicine. Capsicum, if taken internally, will work to heal an ulcerated stomach and may be used as poultice for any inflammation. Capsicum increases the heart action without increasing the blood pressure. Cayenne increases the power of all other herbs; it helps in digestion when taken with meals and promotes secretion of all the organs. 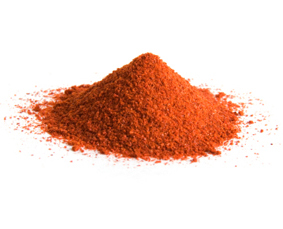 Cayenne is said to be unequaled for warding off diseases and equalizing blood circulation. Cayenne is a very useful herb when you want to quickly improve conditions caused by the flu or a cold. Capsicum can be useful to aid in the removal and cleaning of tissue in the stomach. The effect is to promote rebuilding of tissue which in effect heals the stomach and intestinal ulcers. Capsicum improves the ratio of (HDL) cholesterol which has a protective effect on (LDL) cholesterol which increases heart disease risk. It is reported that Capsicum significantly lowers serum cholesterol and serum triglycerides. Cayenne also increases the liver enzymes accountable for fat metabolism and decreases the fat deposits in the liver caused by a high fat diet. The natural conclusion might be that cayenne peppers may reduce weight gain due to a high fat diet by increasing the speed of fat metabolism (Thermogenesis). Although Capsicum has an active, pungent principle, the irritant only has a strong effect upon the nerve endings of the sensory nerves and has very little action upon the capillary and other blood vessels. While the burning sensation may be severe, there is usually no reddening or blistering of the skin. Capsicum, by reducing blood vessel dilation, is able to help people stop their addiction to alcohol. Capsicum is useful for toothaches by rubbing the powder on the affected area. For use with arthritis, rub the extract of capsicum over the affected joint then wrap with a cotton flannel cloth over night. By combining both capsicum and plantain and then applying this externally, it can draw out foreign items embedded in the skin, such as slivers and thorns. Place the powder or extract on or under the tongue for crisis situations such as shock, hemorrhage and heart attack. Sprinkle a small amount of Cayenne powder into socks to prevent frostbite. Alpha-carotene, beta-carotene, beta-ionone, caffeic acid, campesterol, capsaicin, carvone, caryophyllene, chlorogenic acid, citric acid, cryptoxanthin, hesperidin, kaempferol, limonene, lutein, myristic acid, 1, 8-cineole, p-coumaric acid, quercetin, scopoletin, stigmasterol, zeaxanthin. Nutrients: Amino acids, calcium, essential fatty acids, folate, iron, magnesium, phosphorus, potassium, zinc, vitamins B1, B2, B3, B5, B6, C and E.